HTC today announced its Android tablet, the HTC Flyer. This marks its entry into the tablet market. The announcement was made at the Mobile World Congress. What makes the Flyer worth while is that it is also loaded with the HTC Sense UI along with HTC Watch video service, HTC Scribe Technology and also OnLive cloud gaming. The HTC Flyer has some cool features. It has a 3D screen and with HTC Scribe Technology, it makes it easier to write on the tablet, sign digital contracts, draw pictures, or write on a web page or photo. 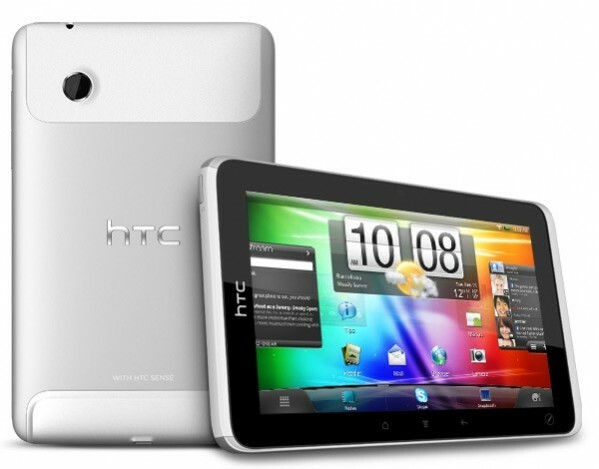 HTC Flyer also comes with HTC Watch which will let you stream HD movies from major studios. One interesting feature is that the tablet is loaded with the OnLive cloud gaming service which lets you play your favorite games on your televisions and computers without needing to buy expensive gaming hardware or software. You can read more about OnLive here. About the hardware – HTC Flyer is packed with a 1.5 GHz processor, 1GB of RAM, 32GB onboard memory, microSD card support, 7-inch touch sensitive screen, internal GPS, ambient light sensor, G-Sensor, and Digital Compass. It is set to release in Q2 2011. No info on pricing yet. HP Slate & Microsoft Courier out of the game. Double sided Tablets from Samsung soon!